I had my cousins with their two adorable twin girls come by the other weekend and I decided to make a brunch treat. My mission was to go with something easy and quick, so I naturally selected a frittata. 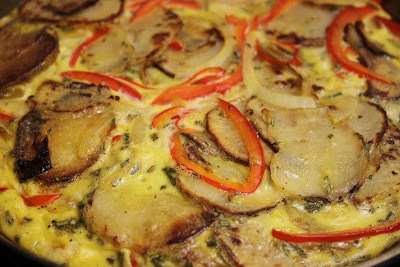 Originally, I was planning to make one with tomatoes and cheese but changed my mind quickly when I saw this recipe for a potato, red pepper version, that reminded me of a Spanish-style tortilla. Overall, the dish wasn't difficult to make, the only pain was frying up the potatoes. I made the mistake by first just sauteeing them, but they didn't get soft enough. So...I took them out and fried them on a non-stick surface. The trick worked and they were super crispy and delicious - sort of like Greek fries I've had at Zenon Taverna or Taverna Kyclades. Once you get the potatoes done, it's all a piece of cake, as you can pour the eggs right over them along with the peppers and the onions. The whole thing was a delicious and very filling dish that felt a lot more substantial in your belly than it appears. Here's the recipe - I hope you enjoy it.